DENVER, CO– The South Central had a lot of eyes on the mixed division coming into the weekend, where three top 15 teams went to war with a lone bid as the prize, which #15 Fort Collins shame. took home. However, the men’s and women’s division added some theatrics of their own, with thrilling games that nearly sent favorites home early. Don’t let the expected advancement of #4 Denver Molly Brown in the women’s division, and #9 Denver Johnny Bravo and #17 Austin Doublewide in the men’s division, fool you into thinking it was all as foretold in Denver. The top of the four pools in the mixed division comprised three teams who competed at Nationals last year and the World Masters Ultimate Club Championship runner up — all vying for one bid to this year’s Club Championships. Two teams, Fort Collins shame. and Dallas Public Enemy missed earning strength bids despite top 16 regular season finishes, courtesy of automatic regional bid allocation. Saturday pool play went mostly to plan for the top teams, with each pool leader winning out. In bracket play, defending regional champion Public Enemy narrowly beat Denver Flight Club, winning 12-11 in the quarterfinals and had to face shame. in the semifinals, which Fort Collins won 15-10. On the other side of the bracket, Love Tractor registered two 15-9 wins against Austin Cosa Nostra in the quarterfinals and against fellow Denver team, Mesteno. Now the two teams in the Regional final were in-state rivals, in a rematch of the Pro-Elite Challenge final that took place in Denver a few months ago. Love Tractor won that tournament and ended the regular season ranked sixth. The final started with traded points as both teams got impressive deep scores from Megan Henderson for Love Tractor and Aubree Dietrich for Fort Collins. Then, shame. went on a four-goal scoring streak and eventually took half 8-6. “I was really trying to not focus on the score and focus on the game,” said Dietrich, who accounted for at least a third of the team’s scores, all in the deep space. In the second half, shame. continued with another string of breaks, and despite Love Tractor bringing the score within two at 14-12, a 20-yard hammer sealed the game and earned shame. a spot at Nationals. Meanwhile Love Tractor was stunned by the upset, despite a gelling offense with good spacing downfield. Throughout the rest of the division, Mesteno took third with a 13-7 win over Public Enemy and despite a “tough season,” proved they could hang with the best, according to members of team. Austin Cosa Nostra beat fellow Austin team Five One Two in a close fourth place matchup, winning 15-13. Many players on Five One Two were longtime members of Cosa Nostra during their Nationals-attending years. Five One Two placed second at the WMUCC Mixed division in July and chose to also play the series with pickups of some non-masters players to fill out the roster. In the rest of pool play, travel delays due to record rainfall Friday night in DFW resulted limited rosters for some Dallas-based teams, with players finally arriving in the early hours of the Saturday morning into the late afternoon. Before Denver Johnny Bravo’s offense could even complete a pass in the 2018 South Central men’s Regional championship game, their offensive unit dropped the opening pull. The early shockwave presaged a far more erratic performance than Bravo’s 15-11 2017 regional championship victory, when their offensive line threw just a single turnover. Despite being pushed to the brink, a more efficient Austin Doublewide squad earned a 15-14 win and a place at the 2018 national championship tournament in San Diego next month. The game was sloppier than previous regional finals between the two rivals – Ultiworld tracked 10 total turnovers in the first four points of the game alone. But on the whole, Doublewide’s offense played with greater precision and comfort than Bravo’s offense through the first three quarters of the game. Brandon Malecek manipulated Bravo marks and carved up lane poaches, connecting on deep shots with speedster Carson Wilder and big man Kai Marshall for multiple quick offensive holds. It was yet another quietly masterful performance by the veteran gunslinger Malecek, who has evolved his game to maximize his offensive strengths and smartly focus his defensive efforts and assignments. He has mastered the art of the huck and the threat of the defensive marking hack, commanding defenses to respect his throwing range and break mark release points. He also calls for intelligent switches at opportune moments following turnovers. To Bravo’s detriment, their defensive unit failed to convert multiple break opportunities at critical junctures in both halves. Though Bravo had trailed 10-6 in the early stages of the second half, their young defensive unit countered Doublewide’s 4-0 run and evened the score at 12-12. With great field position after a surprising unforced turnover by the Doublewide offense, Bravo appeared poised to take their first lead since 2-1. But Marrapode’s blading shot to an uncovered Stanley Peterson in the back corner was too difficult for Peterson to handle, and Doublewide went on to convert the offensive hold and go up 13-12. Though their offense held on their final two points, Bravo’s defensive line wouldn’t touch the disc again. Chase Cunningham and Jay Froude, who played much of the weekend on a stacked defensive line with Kaplan Maurer and Michael Matthis, crossed over to bolster Texas’ offensive firepower in crunch time. Cunningham’s deep receiving prowess was especially clutch down the stretch: he caught Doublewide’s 14th goal over two Bravo defenders and—after elevating over Todd Wolma in the red zone to snag a huck on double game point—threw the assist to clinch Doublewide’s regional championship. Bravo had to refocus after the Doublewide loss for the region’s last nationals-qualifying tilt against #21 Denver Inception, a program that has built its own identity in Colorado while still feeding talent to Bravo over the years. In 2016, Inception was seconds and points away from stealing the third South Central bid from heavily favored Doublewide before collapsing in the game’s final points. On Saturday afternoon, smart defensive pressure and a stellar offensive performance from Wil St. Charles gave the favorites a run for their money. Bravo squeaked out a 15-12 victory in the championship bracket semifinals. During Sunday’s matchup, Bravo applied stiffer defensive pressure and was more efficient after turnovers. Alan Villanueva continued to shine, setting big marks that forced multiple Inception hucks to sail out of bounds. Inception broke to tie the game at 5-5, but Bravo accelerated on a 10-4 run to close out a 15-9 victory. “The biggest difference between our two Inception games was putting in our break opportunities,” explained Bravo captain Ben Lohre. After a disappointing finish to their regular season and coming up short in the regional final, Bravo will likely be the fourth seed in their pool at Nationals. The USA Ultimate end of regular season rankings even make a case for them to come in as the bottom seed overall. With only one bid available, the most exciting game of the weekend was actually Saturday afternoon, when Denver Molly Brown played #16 Texas Showdown in the no. 1 versus no. 2 pool play game. With just seven teams at the tournament, the format called for only one pool, with Sunday bracket play, and one critical caveat: if a team goes 6-0 in pool play, they go to Nationals. Denver took a quick lead 4-2, but Texas registered multiple breaks to take half 8-6. Molly Brown converted a break to start the second half and there was one player noticeably absent from their sideline: handler Claire Chastain. She takes graduate school courses on Saturday morning and arrived at the field when the game was tied 11-11. With a wild back and forth, the game was tied 15-15 when the soft cap horn sounded: game to 17. After a couple of opportunities, Denver scored to bring victory within one. The final point lasted more than five minutes, with Showdown throwing a floating backhand huck to Julia Schmaltz with Jesse Shofner registering the block. Molly Brown followed with an overthrown huck to Rebecca Miller. But the field positioning resulted in Texas checking in the disc near their own end zone. An interception by Allysha Dixon led to the secondary assist to the game-winning score and a Nationals berth. Molly Brown worked to keep their energy consistent throughout the game and always believed they would win, said Durst. The rest of the pool followed generally to expectations, with Denver Small Batch and Boulder Jackwagon holding seed. The bottom three teams in the pool each went 1-5, but Dallas Maeve broke seed with a win against Fort Collins Trainwreck. Inferno’s sole win on the weekend was against Maeve and Trainwreck’s sole win was against Inferno. TEAMS: Austin Doublewide, Denver Johnny Bravo, Denver Love Tractor, Denver Molly Brown, Fort Collins shame. 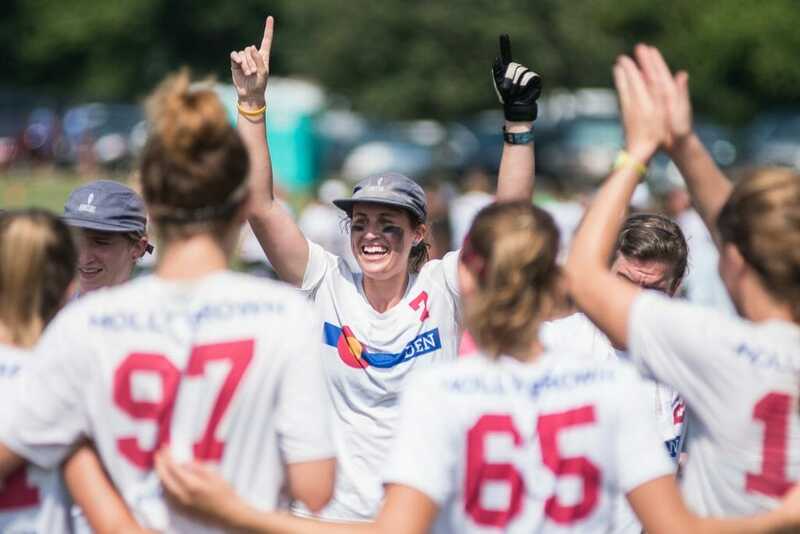 Comments on "South Central Regionals 2018 Recap: Molly Brown Survives Showdown Scare, Doublewide and Shame Hit Stride at Right Time"